Spring is in the air, and school children all across the nation are entering the last leg of the academic year. But before the final bell rings, many students will take end-of-year state assessments designed to gauge their academic aptitude and growth. For a number of children, just the idea of testing can induce anxiety and trepidation, causing them to perform poorly. Many students never truly become comfortable with the testing process. The format of these tests can throw off even the brightest pupils, which is why forward-thinking educators must prepare their students not only for the exam content, but also the format to help improve achievement and progress. Taken together, achievement and progress illustrate how well students perform against the standards, but also measures their growth over time, giving educators a well-rounded view of a student’s learning accomplishment. Practice makes perfect – a mantra that is especially true when it comes to standards tests. Leading psychologist and MacArthur Fellow Angela Duckworth highlights “intentional practice” as being key to attaining optimal skill development. Practice must have a specific intent, and match both the current level of skill development and the next targeted level. Practice materials that strengthen students’ critical-thinking skills and demonstrate how to connect prior knowledge with real-world examples can help them solve even the most complicated test questions. This process helps to make meaning, building on what they know to what standards they need to master. The testing environment itself can be a source of stress, potentially leading to lower performance. Providing students with engaging materials that emulate the tests is great practice that familiarizes them with not only the content and standards, but also the format they’ll soon encounter. Improving students’ comfort with their environment puts them at ease and allows them to concentrate on answering test items. Working with students to prepare them not only for what they’ll see on the exam, but also providing strategies for how to break down questions and work through content to get answers, builds critical thinking and test taking skills. As one teacher notes, “Comfort and a positive attitude can go a long way towards easing…anxiety” Furthermore, research shows that praising students’ efforts rather than their talents helps students perform better.. Familiarity with tech-enhanced item types such as drag and drop, multiple select, constructed response, and equation builders, helps students acclimate to the testing environment. Using these types of items prior to testing day allows students to focus on the content and look beyond how to answer the question. Scaffolded instruction enables educators to reach all learners, from struggling learners to English Language learners to the gifted and talented students, allowing educators to tailor instruction and target each student’s skill and standards deficiencies. Through instructional scaffolding, educators systematically target each student’s needs to enhance learning and aid in the mastery of new skills. While regular exercise has been linked to better performance in school in general (CDC, 2014; Kohl & Cook, 2013), a short burst of exercise for 12 minutes immediately prior to an assessment has also been shown to improve academic performance for a period of 45 minutes (Tine, 2013). Having students write down any test-taking anxieties prior to the test has significant positive effects on test performance. 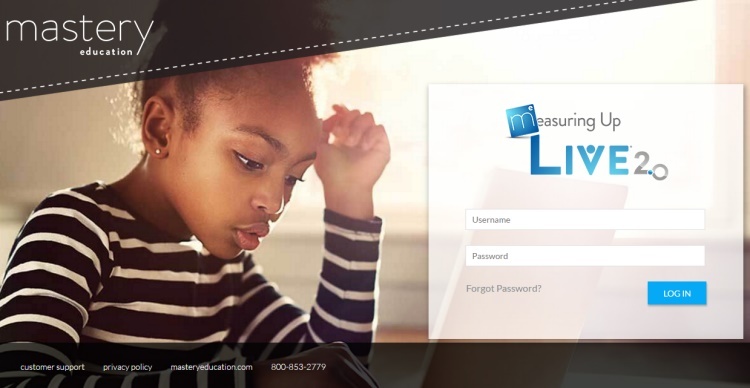 For additional strategies for reducing test anxiety, or to learn more about Measuring Up’s suite of assessment solutions, visit us at online masteryeducation.com today! I would like more information, see a sample or demo. This user filled out the form from measuringupmeblog.com. Learn more about Measuring Up’s blended solutions to assess, instruct and provide differentiated adaptive practice.